Fisheye has a "watch" notification system that sends email notifications to users when commits are detected. Users can opt in for these notifications by "watching" a particular repository/activity stream. 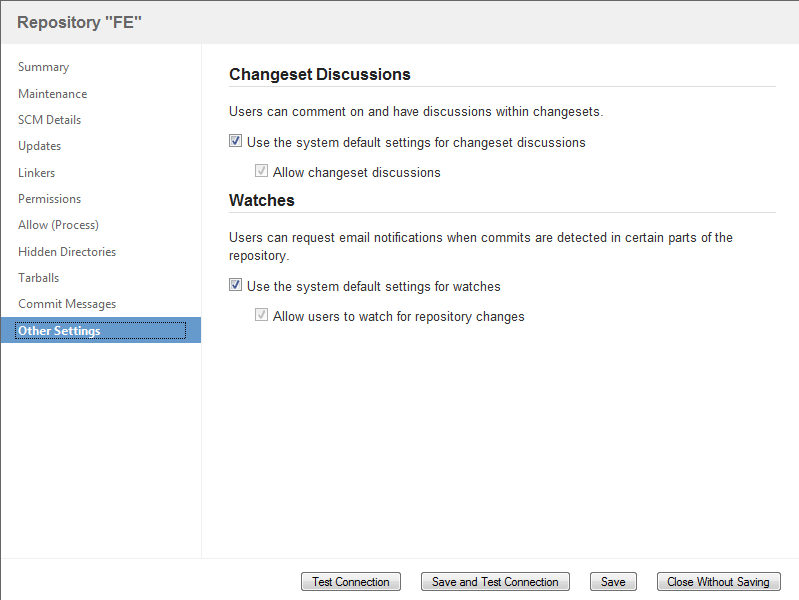 You can configure Fisheye to enable or disable watches for all users for a specific repository or for all repositories. Email templates can be customized if required. Please note, before you can enable watches for your repositories, you must first configure a valid SMTP server. Please also be aware that no notifications will be sent while the repository is performing the initial indexing. See Indexer. Click the name of the repository, (under the 'Name' column in the list of repositories). The Repository Options for the repository will be displayed in a dialog. Click the Other Settings tab. The 'Watches' section will be shown on the screen that is displayed (see screenshot below). Use the system default settings for watches — Check this if you want to use the system default settings for watches, i.e. if you enable/disable watches in your repository defaults, watches will be enabled/disabled for this repository respectively. Allow users to watch for repository changes — Check or clear this to enable/disable watches for the repository. This checkbox will only be enabled if Use the system default settings for watches is not checked. Allow users to watch for repository changes — Check or clear this to enable or disable watches for all repositories that been configured to use the system default settings for watches.